Business Transition Technologies Ltd — Helping managers beat the 60-80% failure rate of business change & IT projects. The dismal success rate of business change/transformation programmes and IT projects in both the private and public sectors, across the world and in a variety of industries [noted elsewhere on this website], do share something in common. What they have in common is that when senior managers gave ‘go ahead’Â approval for those programmes, they evidently failed to ask the incisive questions and/or, didnâ€™t insist on the meaningful answers that would have revealed the fundamental flaws in the proposals they reviewedâ€¦ and blessed! As weâ€™ve pointed out elsewhere on this site, the dreadful failure rate is primarily due to the design of programmes rather than in failures of execution (although that can of course also happen). The fundamental and fatal flaws in the approach taken to business and IT programmes by most large organisations, can only survive because senior managers either donâ€™t ask, or donâ€™t know the critically important questions to ask. These notes are intended to help managers raise those questions â€“ and to help them insist on meaningful answers. This thought-process or mindset,Â applies when evaluating programme proposals or in consideringÂ the continuation of programmes already underway but which escaped serious scrutiny â€“ as the vast majority do escape, at their original approval stage. We will set out a set of questions you can use as your toolkit for quickly assessing the robustness of programme and project proposals. Business Change & IT projects often end in embarrassing, costly failure: they donâ€™t need to. Hereâ€™s how. â€œInsanity: doing the same thing over and over again and expecting different resultsâ€. While thereâ€™s some dispute over who said it, Benjamin Franklin or Albert Einstein, it seems to ring true. And itâ€™s just as true in the world of the projects that commercial and public sector organisations undertake to move themselves forward in some way, such as; business change programmes, cost reduction programmes, business process redesign, ERP Enterprise Resource Planning system implementations or complex IT projects. We tend to go about them in the same way over and over again. We organise and carry out our projects in ways declared â€œBest Practiceâ€. We train our staff in â€œBest Practiceâ€ methods and the consulting firms we engage, tout their â€œBest Practiceâ€ credentials. And the results according to sources such as industry analysts, is that 60 to 80% of these projects are doomed to fail. That is, the business benefits expected by the organizations paying for the projects, will not materialize. 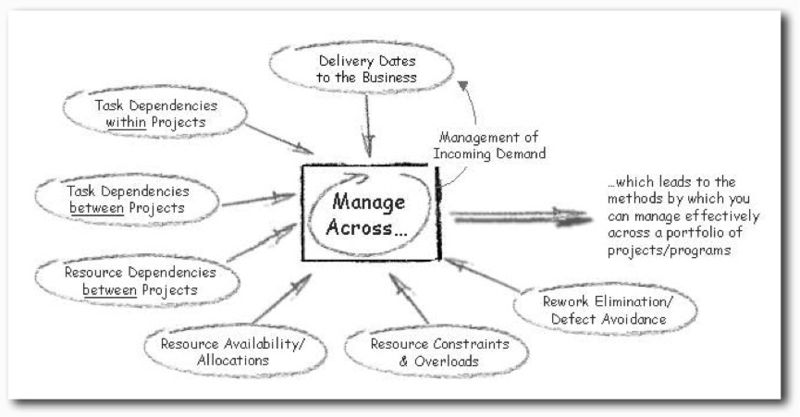 If you have a number of projects running, with potentially some linkages between them and with some sharing of resources – even if, for example, the shared resource is only limited funding, the interactions between the projects and their resources leads to management control complexities which can result in undependable deadline performance. For high levels of management control across a portfolio of projects or programs, the factors below need to be brought into the equation. The big challenge is, that those factors need to be considered simultaneously. The notes below were prompted by a post on â€œCompanies are struggling with change managementâ€ in the LinkedIn forum â€œBusiness Improvement, Change Management & Performanceâ€. Based on 30 or so client projects with some of the worldâ€™s largest corporationsâ€¦ and some of the not so large, Iâ€™ve come to a slightly different view. Thereâ€™s a lot of talk about culture change and its challenges. And yes, there are doubtless challenges around that, but I would suggest â€“ based on 15 years of analysis, research and testing, that many of those challenges are avoidable and are in fact generated by the approach most organisations take to â€˜business changeâ€™ programs. My evidence and conclusion is that what is often promoted as project â€˜Best Practiceâ€™ â€“ frequently some form of project management process based on the â€˜waterfallâ€™ modelâ€¦ which because of its flawed structure and flawed assumptions, is actually at the root of business change problems; rather than the solution it purports to be. This is literally asserting, that the linear structure of ‘waterfall’ process-based ‘Best Practice’ project management methods such as PRINCE2, will increase the difficulties in change management initiatives. Has anyone else come to a similar, scurrilous conclusion? For more information on how ‘Best Practice’ project management methods lead to business change and IT project failures, Â contact us. PRINCE2Â® is a registered trade mark of the Cabinet Office. Do your major projects have a structure similar to the model sketched below? That is, several stages (perhaps each of several or more months), separated by some kind of review meeting. If so, you are probably following a conventional ‘waterfall-style’ project management approach. PRINCE2Â® projects are usuallyÂ structured structured in this way. The conventional structure of projects typically starts with an initiation stage – and that’s not quite the statement of the blindingly obvious it may seem! A proposal for a project is reviewed formally, or informally. Approval is given for the proposed approach and for the allocation of funding, resources or whatever else is needed. The formality or informality of this and the subsequent stages will of course vary enormously depending upon the scale of the project, the size of the foreseen costs, the management norms of the organisation and so on. The initiation and approval stages are followed by a series of project stages. Typically, the stages are defined in a sequence such as Requirements Analysis, Design, Build/ Construction, Test, Implementation or Deployment, and project closure. In actuality, the neatly defined stages may well meld into each other – which will injure the manageability of the project. There are good reasons for why the ‘melding’Â happens, which we’ll discuss elsewhere. In the case of PRINCE2, ongoing maintenance or support of what has been implemented is outside the scope of the project. Depending on the methodology, there may then be the ‘retirement’ stage in which whatever has been implemented is deemed no longer serving its purpose in some way, and is decommissioned. With business projects in mind such as; business change, business process design/redesign and IT system implementations, the pressure to reduce project costs can – perhaps perversely it may appear, also be the opportunity to improve the results from the project – and all at lower cost. There are several reasons why this could well be the case for your projects. This is a result of the shortfalls in the methods used in running projects. So we potentially have immediate scope right there to reduce costs and simultaneously improve the project’s effectiveness. Interesting isnâ€™t it, how what would have been success for the project, only becomes clear to us as we survey the wreckage of its failure. The project should have done this; it should have done that. Confronted with the wreckage, itâ€™s all so obvious and clear now. This seems to apply to business change projects, computerisation (eg. the UKâ€™s National Health IT programme), system development projectsâ€¦ the list goes on. But why wasnâ€™t this new-found clarity available at the start of the project? Why did no one insist on clarity in what would constitute success; and even, what would constitute failure? and have you noticed how much easier it is to talk about activity; of what projects must do, rather than what they must achieve? Maybe, itâ€™s a combination of all of those? The Btt web site has been “off the air” for a year or two. It’s on the way back – gradually! Over the next few months (June 2011 onwards), we’ll be adding quirky, pithy commentary the world never knew it needed.